Notes for the Road: Walk Georgia Blog | Who Inspires You? 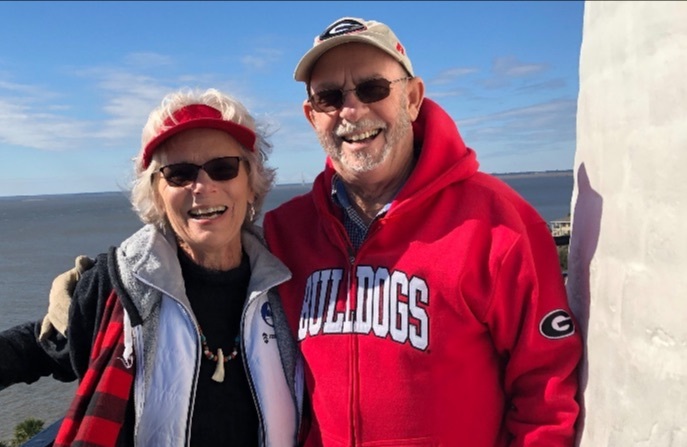 Mike and Lola Beggs at the top of the St. Simons Island Lighthouse, January 2019. I am incredibly blessed to have both of my parents fairly nearby and an active part of our family’s lives. They are a constant source of encouragement and joy to us and many others who are fortunate to know them. Young retirees (67 and 68) who pride themselves on their active and healthy lifestyles, they began walking 3 miles every day, regardless of the rain, cold or extreme heat, about 18 years ago after attending a weight-loss and nutrition class with a registered nurse in Albany, Georgia. I remember my sister and I being perplexed at their interest in this class since they were both already well within healthy weight ranges. At the time, they lived in Tifton, a small town located in rural southwest Georgia. Albany was 60 miles away and this class met at night for three months once a week for two hours. This class and their instructor, Rhena, were game changers for how they lived each day. The class focused on practical ways to adjust your lifestyle with proven methods to live a longer, healthier life. There were sessions on finding ways to work exercise into your day, every day, regardless of any excuses, and strategies to seek out and prepare healthy meals. They have truly lived out this mantra virtually every day since. Well, sometimes even the best-laid plans can be sidelined by forces of health outside of our control. On March 1, my healthy, fit father underwent triple bypass heart surgery to repair artery blockages of 85 and 90 percent, what the cardiologists called the “widow maker” of heart disease. His caregivers cited genetics as one of the most likely causes of his condition, given a family history of stroke and congestive heart failure. We were incredibly thankful that he noticed having a mild shortness of breath during a couple of their morning walks to the “top of the hill,” which is actually Mount Yonah, located near Helen, Georgia. After retiring from their jobs in education and research in 2012, they sold the Tifton farm/homestead and moved to Sautee, Georgia, mainly to be closer to our family in Athens. Their retirement has been filled with daily adventures to find and hike waterfall trails, seek out local eating establishments and volunteer. They are both trained Master Gardener Extension Volunteers and help organize a senior activity education program in Sautee, where my mom has become a somewhat notable local painter and my dad has enjoyed exploring new interests, volunteering at the local food bank and serving on the board of their homeowners’ association. They also bought a camper and enjoy exploring many Georgia state parks and kayaking along the Georgia coast. My husband has been so inspired by how much they are enjoying retirement that he actually began biking and jogging, and has lost 25 pounds, in hopes that we will be able to follow their lead in our 60s. Needless to say, we were all astounded by my father’s recent battle with cardiovascular disease. He is recovering very well, and his providers all have bragged on the extent to which his fitness level has helped accelerate the healing process. We are so grateful that my dad noticed his shortness of breath and took the initiative to schedule a stress test with his local doctor. The level of care and expertise he has received has been impressive, and they have repeatedly noted how fortunate he was to have gotten care before it was too late. My parents are now focused on recovery, cardiovascular therapy, a heart-healthy diet and a continued commitment to exercise daily. University of Georgia Cooperative Extension has a similar program to the one they took part of in Albany, called “Walk-A-Weigh,” which I have enjoyed taking part in with a group on the UGA Athens Campus this spring as part of our employee well-being program. For more information about local health and wellness programs available through Extension, please visit www.extension.uga.edu. Maria Bowie is a program coordinator for UGA Extension and supports employee recruitment, internships for college students and health and wellness programs offered through UGA. Posted in Featured. This entry was tagged aging well, cardiovascular, chronic disease, diet exercise, exercise, heart attack, heart health, inspiration, nutrition, retirement. Bookmark the permalink.